It’s been said what doesn’t kill you makes you stronger. Gillespie’s Randy Redmon and his wife Amanda are a true testament to that age-old quote. Three years ago their house burned to the ground. The lint trap in their dryer sparked and when the heat reached the cleaning chemicals stored in the laundry room, the house exploded. Thankfully the couple and their four kids weren’t home, but the family lost everything. After regrouping, 37-year-old Randy and 32-year-old Amanda bought a small animal farm not far from their previous home. They went on with their lives – he drove a truck for a waste-management service and she worked at a local bank. The kids, from 11-year-old Ambrosia to 17-year-old Logan with Jordan and Chase in between, stayed busy with school and horseback riding—one of the family’s favorite pastimes. Then came Aug. 23, 2014—and once again their lives turned upside down. Leaving a work party, the couple hopped on Randy’s motorcycle and decided to cruise before heading home. Shortly afterward Randy saw the headlights coming at them cross the center line. He yelled frantically for Amanda who was nowhere in sight. Several people stopped to help and that’s when someone found her—30 feet from the accident. “All they would tell me is, ‘She’s in a lot better shape than you,’” Randy said. Both were airlifted to Memorial Medical Center, where their treatment was coordinated through the Southern Illinois Trauma Center at Memorial (SITC). It’s a team made up of experienced SIU School of Medicine surgeons with support from Springfield Clinic, Orthopedic Center of Illinois and Memorial’s emergency teams. This team handles the most complex and severe injuries, often life-or-death cases. And at first, they weren’t sure which group the Redmons would fall in. Amanda’s injuries were severe and potentially fatal. Fortunately she rapidly stabilized with treatment. However, that first night and for several weeks following, Randy nearly died, even with aggressive treatment. He broke his pelvis, arms, eye socket and nose. He had a hole in his bowel, lung contusions, massive internal bleeding, severe nerve damage and his kidneys shut down. It took two weeks for doctors to say he would live. With both parents in intensive care, family members came to the rescue and moved into the Redmon home to care for the children. 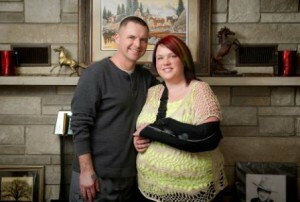 Day by day, Randy and Amanda slowly recovered at Memorial Medical Center, just two rooms apart from one another. Randy remembers waking up one night in a panic and crying out for Amanda. Another nurse brought her into his room so he could see for himself she was OK.
Amanda returned home four weeks after the accident; Randy followed a month later. Both still face long roads in recovery. She is relearning to do everyday tasks one-handed after her left arm was permanently paralyzed. Randy just had his 13th and hopefully, final, surgery. He still doesn’t have feeling in parts of his right foot. The driver who hit them was arrested at the scene for drunk driving and is awaiting criminal charges. Through it all, somehow, the Redmons’ positive spirit doesn’t waiver.